OW WOW! 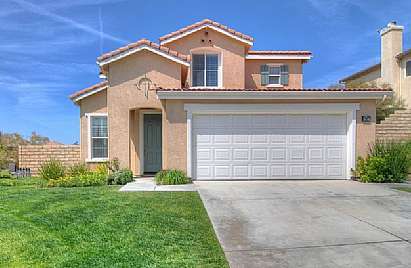 Fantastic 4BR Saugus home remodeled and ready to go! This home has recently received a makeover with 20x20 porcelain tile and plush carpet throughout, granite counters, stainless appliances, gorgeous crown moulding and trim, celing fans, and fresh paint throughout. Floor plan features a formal living & dining room, downstairs bed and full bath, 3 bedrooms upstairs with a nice retreat off of the master. Brand new heater, air conditioner and rear landscaping! This home is situated on a large corner lot with potential RV access. No HOA, no extra taxes, just a great home! STANDARD SALE!! !